I just came across a rockin’ demo of the Wampler Pinnacle Deluxe Distortion. Definitely on my list of pedals to try. Wampler has definitely carved itself a nice niche in the world of quality pedals and the Pinnacle is no exception. This pedal will give you the mild/warm overdrive to over the top high gain fury and is also known for it’s “Brown Sound”. Controls include Modern/Vintage toggle, Tone, Volume, Contour and Gain. Additionally there is a Boost switch on the pedal as well. The demo by nickjohnstonguitar has him playing his favorite settings with a Les Paul and a Strat. My only complaint with the demo is there are no references to his sound before the pedal. I’d like to hear what his amp sounded prior to the demo. This guy definitely has some skillz to pay the billz. 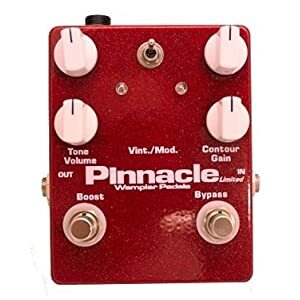 If you’re thinking about picking up the Wampler Pinnacle Deluxe Distortion, they are available for $229.97 on Amazon. Also, the Wampler Pinnacle 2 “Brown Sound” Distortion is available for only $199.00.